There Is No Participation Fee For This Meeting. Kindly Go Ahead With The Free Registration Process. Greetings from Institute Of Directors!! 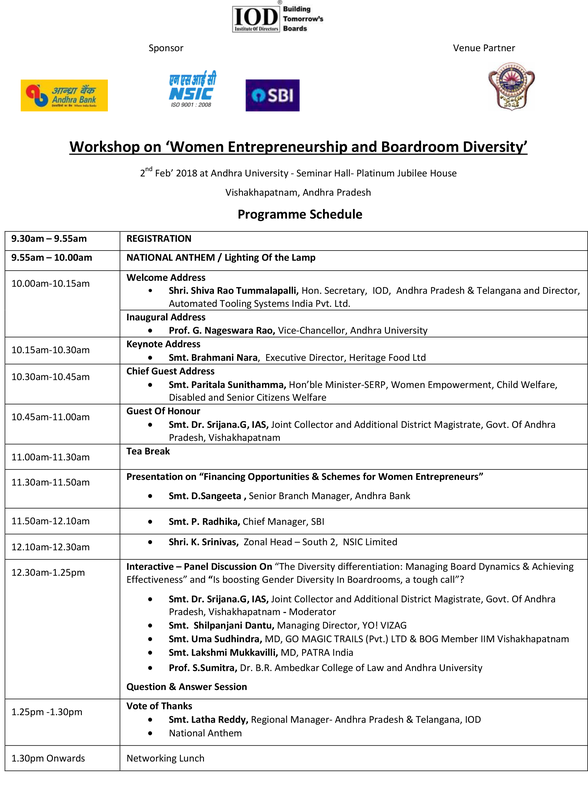 We are happy to inform you that Institute Of Directors (IOD) is organizing a Workshop on “Women Entrepreneurship and Boardroom Diversity" scheduled on 2ndFeb’ 2018 (Friday) at Andhra University - Seminar Hall- Platinum Jubilee House, Vishakhapatnam, Andhra Pradesh from 10.00am to 2pm followed by Lunch. Women Entrepreneurship and Boardroom Diversity is a key of economic growth and development. Women Entrepreneurship and Boardroom DiversityDevelopment has played very important role in achieving the goals of development in self employment in specific and industrial development as a whole.Entrepreneurship Development assists the people to improve the standard of living. Since 1991 Government of India adopted liberalization, privatization, and globalization. It provided accelerated growth to economy. But it is found that some strata of the society are socially, educationally, and financially excluded. The development was avoided of such certain classes of the society such as women. Therefore it was need to provide them opportunity to venture in commercial enterprises, so as theywill attain their livelihood as well as they can improve their economic condition. The workshop will focus on the role of Banks and Financial Opportunity and schemes for women Growth, The Diversity differentiation: Managing Board Dynamics & Achieving Effectiveness” and “Is boosting Gender Diversity in Boardrooms, a tough call”? And other organizations working for the development of Women Entrepreneurship and Boardroom Diversity, etc. will be addressing the participants. This highly exciting and challenging workshop is intended to be a forum, discussion and networking place for professionals, administrators, educational leaders, policy makers, industry representatives, and new seeking entrepreneurs. We take this opportunity to invite you to participate in this important meeting. In case you are preoccupied, you may depute a relevant senior representative from your company to attend the same.There is no participation fee for this meeting. Draft programme copy will be sent to you shortly.